As the first pictures started to appear on my Facebook page, I was reluctant to admit that my eyes had begun to water. Pictures from my homeplace, the first snow of the season. 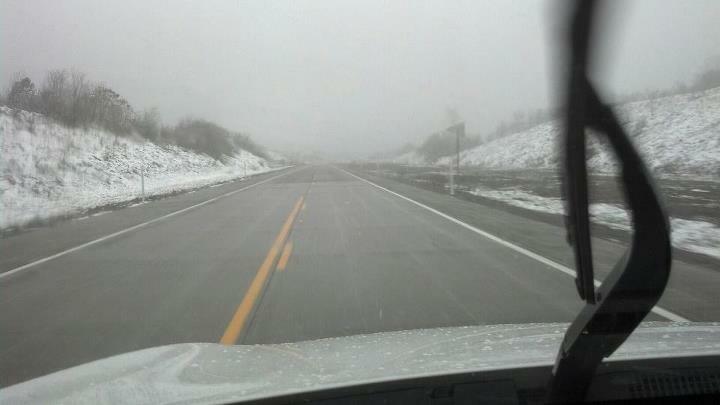 White glistening powder on the sides of the roadway, it is only October, and there is snow. For the many friends and family that live in West Virginia and Southeastern parts of Kentucky, it means a much too early winter, treacherous road conditions, impassable mountain roads, and a chilling, damp cold that cuts to the bone. Yes, absence does make the heart grow fonder. While they are dreading the end of warm days, I am envying their snowy forecast. Winter for us was all about the fun stuff. I can remember playing in the snow, well, as far back as I can remember. I took it for granted that there would always be a hill to slide down, a snowman or an igloo to build. You could always find someone out and about playing in the snow. You always had a partner for a snowball fight, which was great until the temperatures dropped enough to make the snow into “ice” .. I still remember the sting of being hammered with a few of those. Mostly, we played in our yards with our cousins, friends and family members. Our playground expanded to more than just our yard. We roamed the bottom we lived in and enjoyed as much of the snow as we could. I remember how excited we were to check out everyone else’s snow creations! I notice a lot of things now in this picture. First of all, the snowman. He has ears? He is donning a blonde wig? and wearing a Coal Miner’s safety hat? Okay, so he’s a little different. Honestly, he looks more like a bear! What happened to “twig” arms? This dude is toting two tree limbs? Maybe he is planning to ski? or two switches for later use! If you know my momma’s brother, Uncle James? 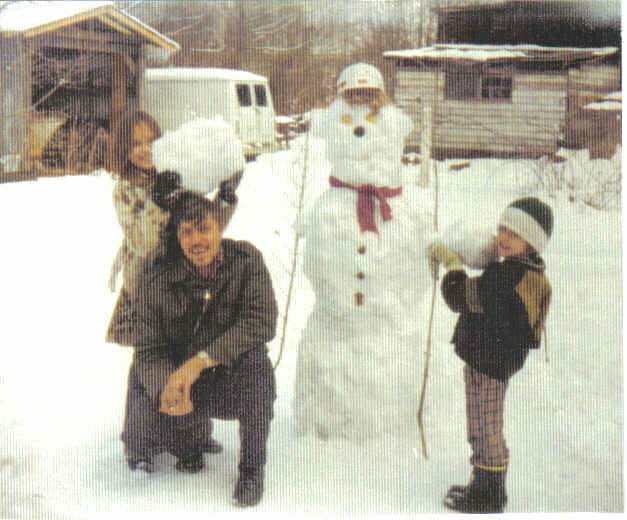 well, it just explains that crazy snowman, and especially us posing with huge snowballs to throw at him. He knew how to have fun. Everything about this photo says FUN! He never really showed us mercy in the snowball fights, why should he? He was in self-defense mode. It was on! Yes, he did “let” us throw the big ones at him. I’m sure we most likely missed! It snowed so much that particular year, we were able to make an igloo that lasted for more than a week. My brother and I would take a snack and go “sit” in the igloo! at least until the seat of our pants were wet and cold again. My mind started to wander back to so many of the great snows we enjoyed as children. I remember the anxiety when it snowed on a sunday night, hoping it would be enough to cancel school-incidentally, that required more back then than just a few inches! If we did go to school, that meant an experience all its own trying to get the school bus to make it to the top of the school hill.. This sometimes took a “hang on, we’ll try one more time” and then if unsuccessful, we’d have to walk! Mom and Dad would remind us nightly to “leave the water dripping” so our pipes wouldn’t be frozen. My brother would have to get in extra coal to keep the fire going in case the electricity went off. He probably has some not so good memories about these parts of winter! It was great to be a girl, until you had to heat dishwater to wash the supper dishes. We would walk to our friends’ houses in the snow at night. I can still picture the clear sky full of stars, and a huge moon lighting the way, so bright that it looked like every inch of snow had jewels embedded. We would make the journey to join practically the entire neighborhood for a bonfire of tires, and whatever else we could find to burn, and then we would sleigh ride. We rode inner tubes, old tires. I don’t recall ever seeing a “real” sled? We could always depend on someone to bring a huge, yellow “mining curtain” that we would all pile on. It always ended up in a massive train wreck at the bottom..but back up the mountainside we’d go. It seemed like it took forever to get back up on that hill, for an 8 second ride that you hope didn’t land you in the unfrozen parts of the creek! We would stay until our feet had gotten wet (I don’t remember owning snowboots or gloves) and no one else had anything left to burn to keep some lights going. I hated the sock gloves, because your snowball would stick to them, a waste of patting and molding it! I thought about how carefully we would adorn the sock, then the Betsy Ross bread bag, secured with black electrical mining tape, then the other sock and finally, the now tight-fitting shoe. The longer your feet stayed dry, the longer you could stay away from home. Keep in mind if you had wet feet? you still had the long, cold trek back home which was absolutely miserable! We would drag in wet and cold, only to have Momma’s hot chocolate on the stove waiting to warm us up. She always seemed to know when we were about ready to come home. She didn’t care about playing in the snow, but she made sure we were able to enjoy as much of it as we wanted. “No yellow snow” or “Get the snow from up high” I can still appreciate her words of wisdom for our delicious batch of snow cream! After we would get a change of clothes, Dad would always say he was going to go and “check the roads” and my brother and I would always ask if we could go? He always said yes, and unlike my Momma, we knew exactly what he meant by “checking the roads” .. that meant testing the road to see if it was slick! Spinning out, donuts, whatever you want to call them? round and round in the store parking lot ..that’s how we checked the roads! I know his ears were sore from us screaming every time we spun around. Okay, so maybe I was the only screamer, but I think Dad enjoyed it even more than we did. Yes, I miss it. I think I will always miss the great snows. I will always miss “Home” but I will always have great memories because of the people I was surrounded by. Maybe this year, we will have our little piece of home around here. Until then, I’ll just enjoy the memories, Momma’s hot chocolate, cheese popcorn, and all the snow pictures I can look at. Truth is, we live in hot water every day. At home, at work, even at church? (ssshhh) Hot water situations… conflicts, hurts, disappointments, trials and tribulations. It’s a part of our day-to-day living. James 1:2-4 speaks of this hot water referring to them as “Trials and Tribulations” – “Consider it pure joy, my brothers and sisters, whenever you face trials of many kinds, because you know that the testing of your faith produces perseverance. Let Perseverance finish its work so that you may be mature and complete, not lacking anything.” Whether we like it or not.. we are going to have bad things happen to us. We are going to have “trials of many kinds” and yes, It is difficult to “glory” in tribulations. Hot water can also be pretty useful! If used for a specific purpose: cleaning, disinfecting.. adding it to something else for cooking things we love such as homemade soup, pasta or a delicious cup of hot chocolate! Hot water can bring out many different flavors.. And we all know how much a good ol hot shower is enjoyed, especially after enduring a time without electricity during one of our hurricanes. Although everyone knows my love for coffee, what you may not know is that my first love was “tea” I often have a cup of hot tea before bed time. I grew up watching my granny drink hot tea. After a long, busy day, she would sit and enjoy a cup of hot tea. I was too little for hot tea, but that didn’t stop her from sneaking some to me on occasion. This lesson is about hot water.. and about the lesson I learned from tea… preferably the tea bag itself, and how it relates to us. If you take a good look at the tea bag, they are basically the same. I just happened to use one that was Kosher from Israel. This was my “special” tea from a dear friend. Just a little pouch that contains the grounded tea, a string, and a tab to hold on to it. What is the part that counts the most? It is what is inside the tea bag.. It represents us.. our inner most parts.. the people who God created in his likeness. The person that we really are. We all started out the same.. Born as sinners, redeemed by His son, Jesus.. and saved by Grace. The amazing thing about the tea bag is how it works! In order for it to become anything useful, you have to add what? WATER! if you add cold water, it’s going to be weak.. It requires Hot Water. That’s life, Hot Water.. and we have to live in it, function in it. and learn to survive in spite of it. The second thing that I see is that the tea bag itself has to be porous in order for the hot water to flow thru and fulfill it’s purpose. When we build walls in our lives, shut people out, and harden our hearts towards God and others, we are not going to get the full effect of being porous in letting God’s light flow thru us.. all.. while we are in the hot water! So we are in hot water.. what is going to happen? If we are using cold or lukewarm water, then not much is going to happen.. We may see a little bit of result, but it’s not likely to go thru many changes. It’s only when we add the hot water.. that the real flavor comes out.. noticeable changes start to take place! What we are on the inside, comes brewing to the outside! It is when we are in Hot Water that we start to show changes, and have choices. Changes in our circumstances, changes in our attitudes, and changes that occur deep inside of our hearts. The innermost parts of us. How we decided to deal with these changes when we reach our “boiling point” determines the product or person that we become-it determines our flavor! 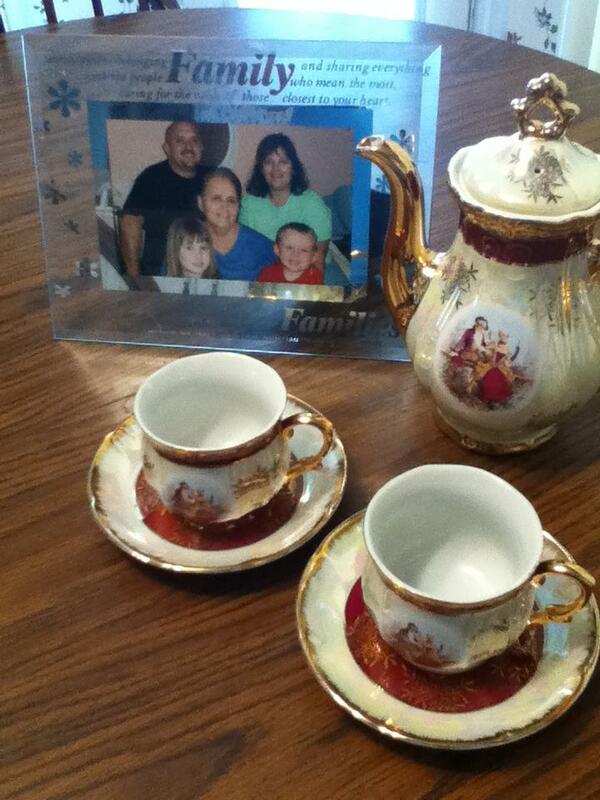 We celebrate my mother’s birthday every year by having a tea party in her honor. It seems fitting because it was something she enjoyed doing with her granddaughter. It seems even more so, when I look at the things I have learned from that “hot water” time in my life. 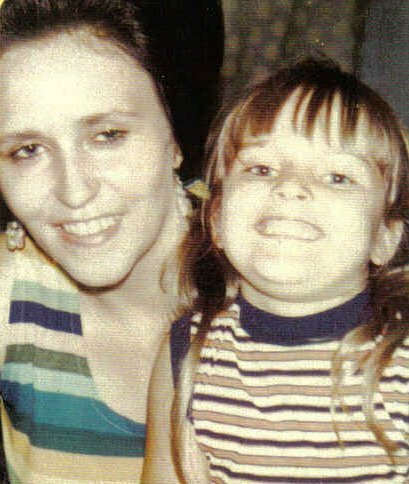 We were not given the choice for her to be sick and leave us early, but there were so many things that I learned about myself. My innermost parts. My aroma..went through some changes. I would love to forever remain a calming Chamomile flavor.. but the truth is sometimes I am like the sour lemon in tea.. What is the aroma that we give off to others? Have you ever let the tea bag boil too long? Oh wow.. it gets bitter. Like the tea that has been boiled in the hot water too long, sometimes we give up and chose to stay in the middle of our hot water of life way too long. We suffer from being in the water too long.. just as those around us do. I love the quote that says.. People will seldom remember the words you said to them, but the will ALWAYs remember the way you made them feel! Powerful words! God always provides for us, a comforter and gives us tools to survive the hot water of life. But just as any mechanic knows.. the tools have to be picked up and used, they are not going to do you any good lying in the toolbox. God provides this through His word, through people in our lives that offer encouragement. Our cheerleaders in this world of hot water! Regardless of my circumstances, I want to produce a pleasant aroma for God and those around me. When I am in hot water? I want those around me to still see that I am real, and I am clinging to His promises. Remember, it’s what’s inside you that determines your flavor. The Hot Water of life is going to come, that’s a given..Determine your flavor! Here are a few of my favorite scriptures to sweeten your tea! Enjoy. One of my favorite lyrics from the old hymn “God Leads Us Along” that says… Some through the waters, some through the flood, some through the fire, but ALL through the blood. Some through great sorrow, But God gives a song..in the night season, and all the day long. What is your aroma in hot water? My desire is to be one that comforts and soothes, not weak or bitter. Classic Earl Grey or soothing Chamomile! I knew that blogging would eventually bring me here. I didn’t know how long I would continue to avoid being here. For whatever reason unknown to me, for this particularly late nite, sleep has escaped me.. and Here I am. I have less than a paragraph, and already has proven to be quite difficult. Maybe I’ll just begin with the title of the blog. Easy enough. I’ll start with the moon. However, it is impossible for me to think that I am capable of completing anything where you are concerned, in one blog, one page, or one contained message, so I won’t try. I am a firm believer that you have to be taught compassion. We are selfish by nature. I truly believe that you have to be taught to have empathy. Things we really know nothing about unless we can learn by example. You have to be taught the art of comforting, consoling and being a true shoulder to cry on. How many times do we really know the right thing to say? Seldom. It doesn’t keep us from trying. It never stopped my Momma. If she could say nothing else? I could always depend on her to say “Oh, I’m sorry, sweetie” or something to that effect. She always comforted. She always consoled. She always tried to fix it. I instantly go back to the times that if “I’m sorry” didn’t really console me? She would automatically chime in and say, “You know I’d give you the moon and stars, if I could.” The thing about her, is that she meant every word. It was her way of letting me know that she hurt when I hurt, and it earnestly broke her heart knowing there was nothing she could do to fix things. I would continue to cry even harder realizing the depth of her words. After Seven Years, I still drift. I have lost my anchor. I always feel like I am forgetting something. I’ve lost or left something. Then, I remember. She’s not here, the anchor holds to nothing. No living parents. I am an orphan. Do I believe I will see her again? Absolutely, but until that day…I will always feel the void. I will continue to feel that I am missing something… forgetting something. I will be jealous of Mother’s Day…I will be annoyed when other’s take it lightly. I will feel like saying to them “There will come a day when there is “No More.” Nothing. Trust me, take no single moment for granted. Some days are just harder than others. They have no warning. I have no clue why it is this way. I only know that I grasp onto every good thing I can remember on those days. Having one of “those” days…. I was piddling in my jewelry box. Lost earrings that would never reappear, and a few necklaces that would never be untangled. Ever. And, there it was… pressed down into the bottom of the tray…my reminder of the promise from my Momma. Tangled around the sterling silver chain, a silver moon with a tiny star attached to the top. My moon and stars, she gave them to me many years ago… She sees them now, from a different view. She knows how totally wonderful they are. I haven’t forgotten her promise. Promise me the moon Momma, once again.. Promise me the Moon. I place the necklace back into the tray ….it is fragile and almost broken from wear. This time, I smile. I am reminded of how she comforted, how she promised me the moon and stars…..and how anxious she must be to share them one day. After all, she must be… because Momma’s keep their promises…. even if it is the moon. Today’s blog idea comes from my 12-year-old. Have I mentioned that I just love her? I am continually amazed at her insight to the spiritual side of life. This aspect of her alone sometimes overwhelms me. We recently brought home a 500 piece puzzle. Not one of great colored flowers, vast ocean scenery, but ducks! 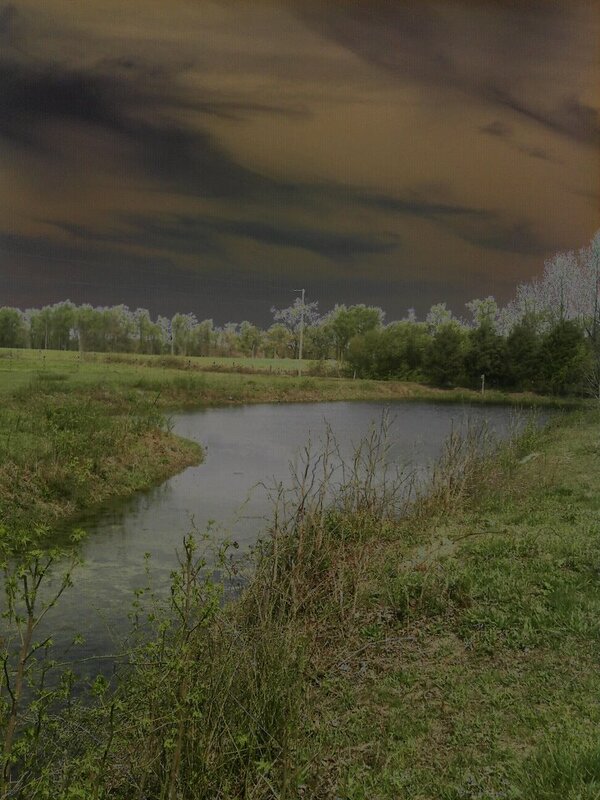 …”Mallards at Dusk” needless to say.. the colors are brown, black and greens. Not really my favorite for matching up pieces. As a matter of fact? I dreaded even starting the thing! The box was opened and every piece spread out on our coffee table. She gets her camera and takes the first picture? “This is a good idea for one of your blogs” she said. I continued to listen to her explain what she meant. So, in good faith, I simply couldn’t put off her idea any longer. The pieces are scattered, unanchored and jumbled. An object without form, beauty or direction. We are similar to the jigsaw puzzle, knowing that there is beauty to behold, but not without the hard work that comes with putting the pieces together. How many times do we appear to have everything in place? Everything seems to measure up on the outside? We have smooth edges and sharp corners that we allow to define us. “We have it all together” we like to say. Then I noticed that other than the piece that I had put in the wrong place, the inside frame is empty and void. I know that eventually it will not be, but not without the work that lies ahead. I like what 1 Peter 3:3-4 says -New Living Translation (NLT) “ Don’t be concerned about the outward beauty of fancy hairstyles, expensive jewelry, or beautiful clothes. 4 You should clothe yourselves instead with the beauty that comes from within, the unfading beauty of a gentle and quiet spirit, which is so precious to God.” I love the fact that regardless of what my outer appearance says, God knows what I am on the inside. He knows what pieces are missing and what it will take to shape them. Without Him, I remain just a pile of pieces, scattered with no purpose or direction. I continually work on the inside of this puzzle. Quite frankly? I am overwhelmed and frustrated. It’s a little more than I bargained for. What am I missing? I give up. I just can’t seem to make them fit. In the meantime, one of our friends drop by for a visit and immediately eyes the puzzle. She is there for only ten minutes and starts to place one piece, then another, and another! Okay, so I’m intrigued watching her. She made it look so easy, and I found it difficult. I ended up having to step away momentarily. I just couldn’t find the missing pieces. I went back to the puzzle on a different day, a fresh start. Amazingly, I found a piece, then another. 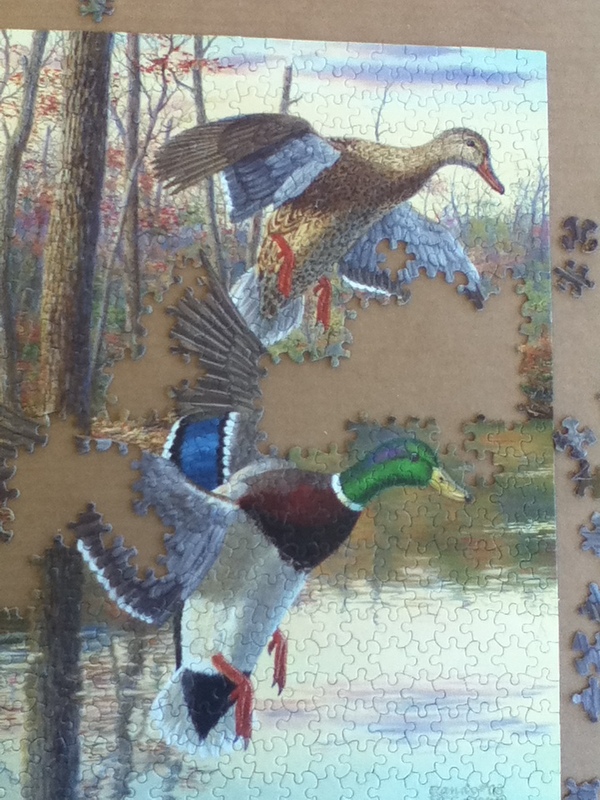 I became enthused again about the progress of the puzzle. The same way that I get enthused when God works a piece of my puzzled life into place, I start to see something come together that actually “fits” or makes sense. In the beginning, I only saw frustration, and a jumbled mess. Just as my friend said, sometimes you just have to step away…there’s nothing more you can accomplish. Did I mention that I have some awesome friends? When I try to figure things out on my own, it seldom makes sense. My twelve-year-old told me at the beginning of this puzzle -“Without God, we are like these puzzle pieces, all mixed up.” Kudos to you my daughter..you are wise beyond your years. As you can see, the puzzle is almost finished. I find that “Mallards at Dusk” are not so bad after all. Actually, it is turning out quite beautifully! I almost waited to blog when it was entirely complete. 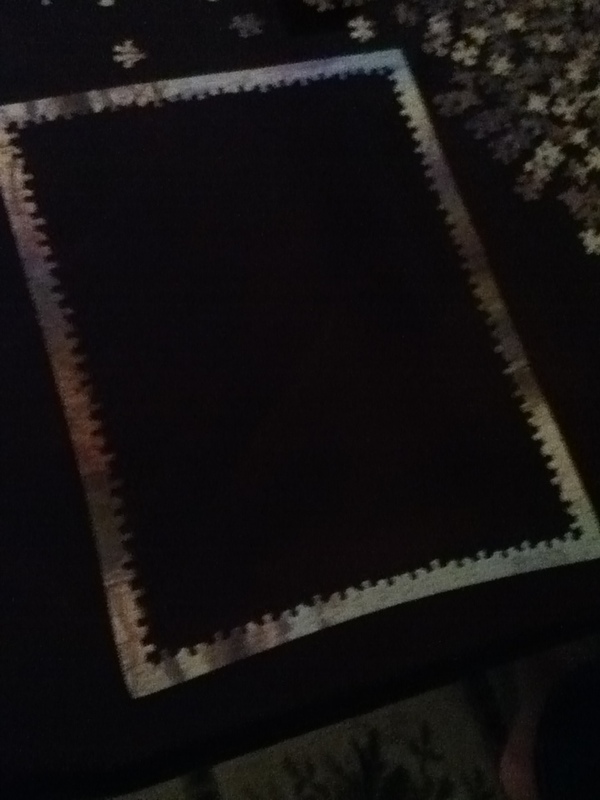 I realized that the puzzle speaks volume to me on the inside. I am not finished. I still have some pieces missing. I have not “arrived” by no means. 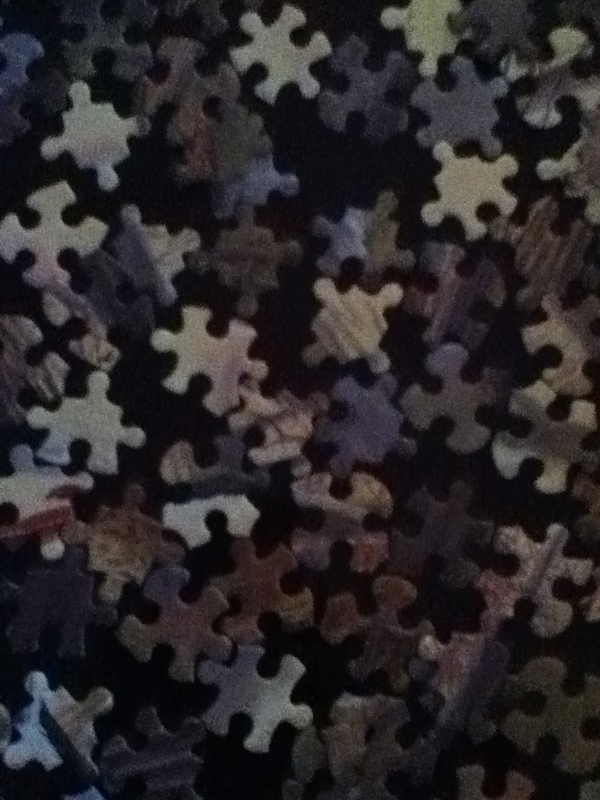 I patiently wait for the master puzzler to place the pieces, making them fit perfectly as only He can do. The puzzle will be finished this week, I am sure I will find the need to step away a few more times..but it’s progress. Maybe I will save some for our friend to finish since we enjoy watching her work her magic! Regardless, we are a great work in progress! Don’t give up on the things that puzzle you? Ask for God’s direction..give him control over your “pieces” It will be an awesome journey my friend! Rain, Rain, and more Rain….. Anyone that knows me, well, you know I do not like rainy days. It makes me gloomy. On rainy days, I don’t venture out unless it is absolutely needful or someone needs me in an extreme sort of way. I know we need rain, It’s just not my favorite kind of day. Water soaked grass, wet driveways, and the constant dripping down my window panes. I don’t know why I don’t like the rain? I have many friends that love, love, love a rainy day. Maybe they enjoy the sound? Maybe it gives them a moment to slow down? I have never enjoyed it as far back as I can remember. I know it is needful. I have seen many times when just a drop would have been welcomed on our garden, in our evaporating swimming pool, or just to cool off enough to be able to function on a sweltering day. Without the water, we suffer…we dry up…we are parched. Thirsty and wanting. The truth is, we are never satisfied. We want rain when it is dry and a break from it when it is too wet. Philippians 4:10 says…”I have learned, in whatever state I am in, to be content.” I am still learning. Learning to accept the good with the bad, seeing the purpose behind the “rainy days” to prevent us from being in such a state of drought. I can relate to drought. Dried up, finding it difficult to get a full breath of air, a hassle to make small efforts without exhaustion. Like a piece of old driftwood, dried and weightless, capable of being blown away with the smallest amount of wind. During these times, we want only what we wished away – a fresh rain… a monsoon of water. We are seldom satisfied. The awesome creator made the soul. I can’t visualize what it is made of? I can relate it to the image of a mere “sponge” – porous, permeable by water. It makes perfect sense that the soul would be similar to the sponge. Too much water, and it is saturated, too little and it is dry and in danger of cracking. 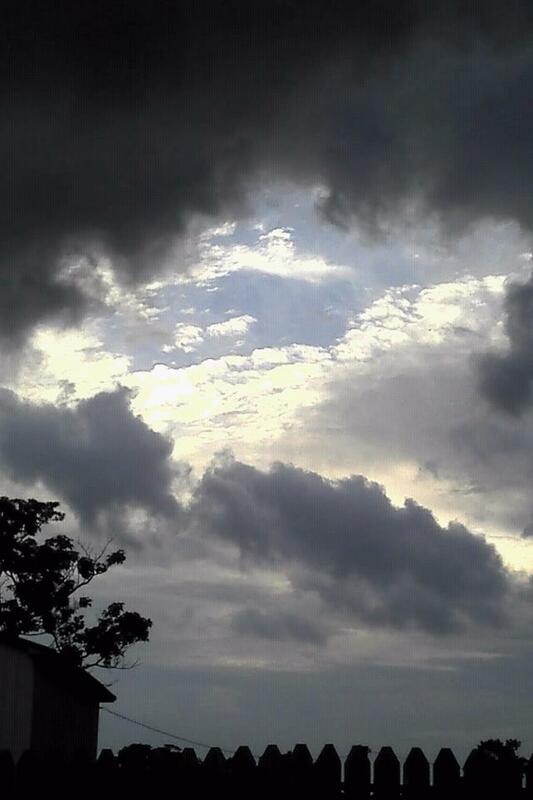 Overwhelming burdens (monsoon)…or becoming complacent (drought). How do we find the middle ground? Our attitude…determines our altitude. And no, I am not saying that life is glorious as long as you have a good attitude. I don’t agree. Sometimes, life just happens, knocks us to the ground without a good reason. I love the quote that our pastor uses frequently…”Life’s tough – Get a helmet!” how true! It’s what we learn from the monsoon and the drought that makes us appreciate the good weather seasons in our lives. It’s making the choice – intentionally to be “content” in our current state..atleast long enough to make it to the better seasons. Be encouraged during the monsoon season and in the drought! Remember it’s only a season, and they change!!! faithfully…..I have to leave you with one of my other favorite quotes (yes, you will find I have many!) “Life is not about waiting for the storm to pass, it’s about learning to dance in the rain.” Okay, so I’m not a dancer…but maybe today is the day to just give it a try…even if it requires finding my rain boots. Everyone knows that I am a coffee lover..coffee hound..cup of joe junkie. I have been for as long as I can remember. It started with sneaking some with the grown-ups, I don’t recall it being love at first sip? We all know that coffee is somewhat of an acquired taste. Lot’s of folks love to smell it while brewing…and it pretty much ends there. There are more things that I love about coffee, other than drinking it. First of all, I have visual associations with the ordinary cup of coffee. I see Aunts, Uncles, Cousins, Friends..and a coffee pot that was forever in need of refilling. I can smell coffee, and my mind immediately drifts to the images of some of the most precious faces gathered around a kitchen table or living room sofa, sometimes on the front porch swing! Enjoying the coffee and the extra bonus of great company. Blends of the most special kind – family and friends.. each one so different. Strong, Bold, Medium, Robust, even Imported!! I have fond memories for each and every one of them. Secondly, a good cup of coffee has a lot to say! What makes it good? How strong is too strong? Weak…well, not many folks enjoy seeing clearly to the bottom of their cups! Do you really have to embellish coffee with substitutes, creamers, and syrups in order to be able to tolerate it? Can you handle just a simple cup of black coffee? 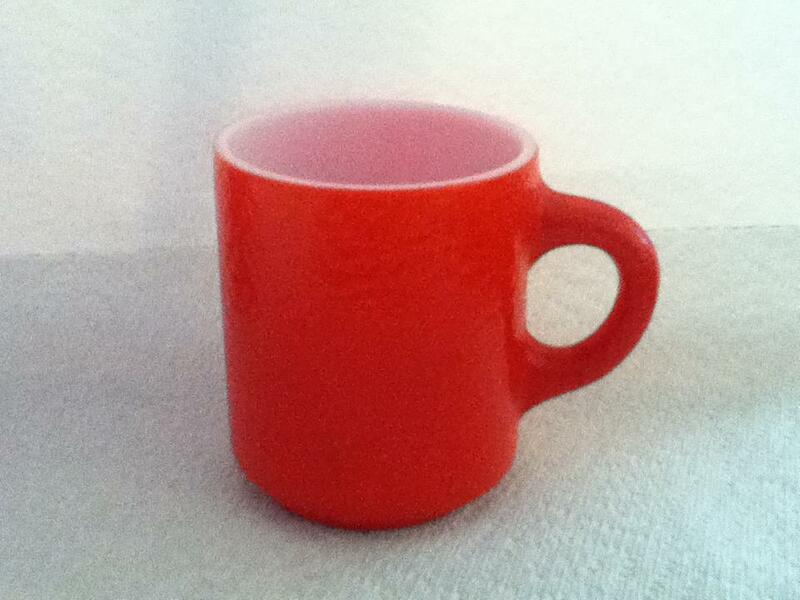 What about your cup? I know I have my favorites that seem to add to the pleasure of drinking mine in the mornings. 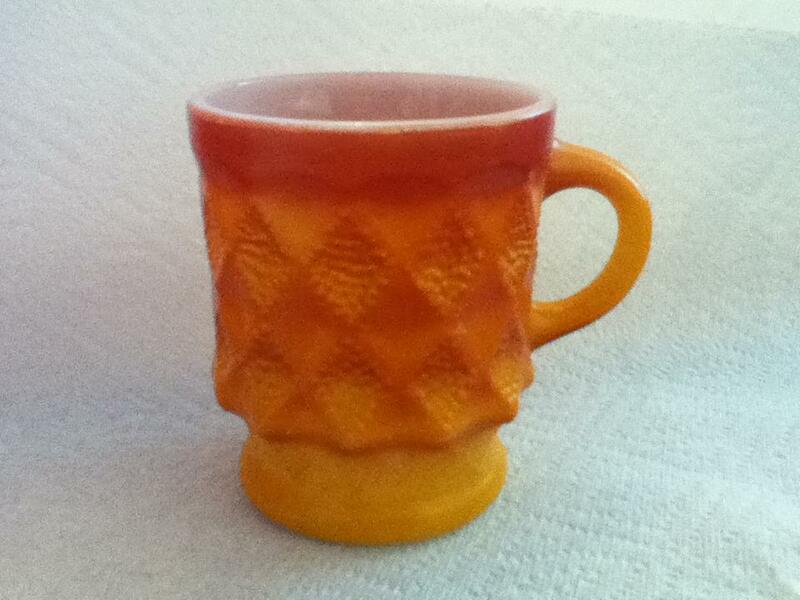 A mug that resembles the ones my grandmother had in shades of green, yellow and orange (mine above!) make me feel a little warmer on the inside! 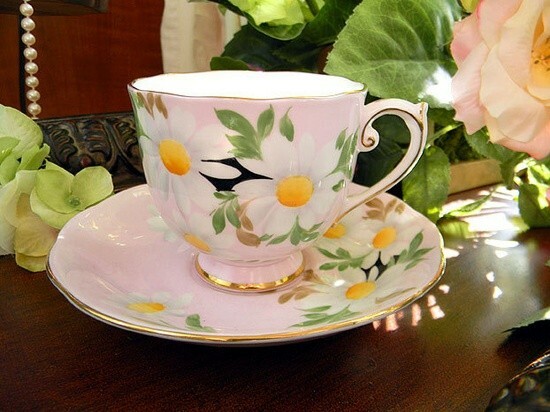 Some mornings I may choose a special cup that a friend has given me….just because it was a gift especially for me? I know some folks that enjoy a “glass” of coffee (I am NOT naming names here!) I have never understood the concept of this, but..apparently they enjoy it in this fashion. As a coffee lover, you never seem to tire of the smell, taste, and the memories that come with it, but.. I have to ask the question? Have you ever had a BAD cup of coffee? Nothing is worse or more difficult to tolerate – than a BAD cup of coffee! Yuck! Seems no matter how many great tasting creamers and concoctions we add, it remains just what it is.. BAD! It may be bitter, stale, cold (and not the good kind), sour or just too weak! It’s pretty unforgettable, right? Sounds like people in a lot of ways don’t you think? We tolerate, wince at the very site. We often say, “No thanks” To me, coffee is much like our attitudes, when our attitudes mirror bad coffee, no matter what you try to spruce it up with? You are still going to have what you started with..and a lingering after taste! I must say the times I have endured Bad coffee..it was only because I knew that the person meant well, I knew the intent and not everyone is capable of making great coffee. Aaah..Tolerance. I want to BE a good cup of coffee!!!! I want the bells and whistles that go with it.. the memories of friends and family enjoying each other’s company. I want the blends of pleasant varieties! I want to stir up latte’s and laughter! Coffee grounds by themselves are not pleasant.. it takes the mighty work of a filter… in order to let the good stuff flow to my cup….the same with my attitude.. being aware to use my “filter” so the good stuff keeps flowing and perking into a cup that “runneth over”..it tends to taste much better that way without being stale and bitter. A good cup of coffee indeed has a lot to say….and for me lots of great memories! I look forward to enjoying a GOOD cup again real soon with some great friends and family! Join someone for a cup..and make it a good one!